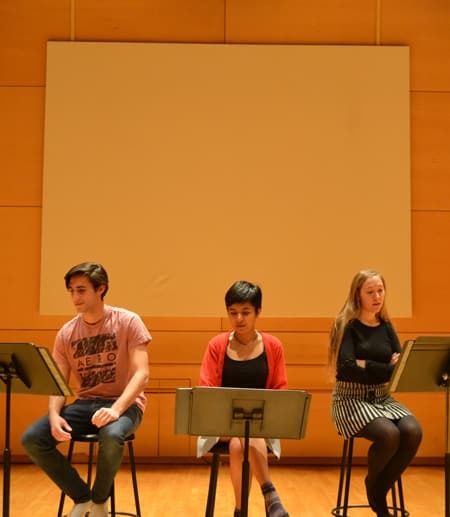 The winning stage and screenplays from this year’s Heermans-McCalmon Writing Competition will be showcased Friday, March 23, at 4:30 p.m. in the Class of ’56 Dance Theatre at the Schwartz Center for the Performing Arts. “Winners of the competition have the rare opportunity to workshop their scripts with guest faculty and student participants and to see them transformed onto the stage or screen,” said Pamela Lillard, director of productions and events for the Department of Performing and Media Arts (PMA). The presentation includes staged readings of the first- and second-place winning plays, Basak Akman’s ’19 “I Did Something” and Gloria Oladipo’s ’21 “The Forever War”; a film of first-place screenplay winner Sarah Nixon’s ’18 “In the Cold”; and a style plan of second-place screenplay winner Madeleine Gray’s ’20 “The Absence of No.” Following the presentations is a panel discussion moderated by PMA faculty member Aoise Stratford, featuring playwright and novelist Kia Corthron and playwright and screenwriter T.D. Mitchell. Nixon’s screenplay received special treatment earlier this month, when visiting cinematographer Ivan Rodrigues worked with students to film the script during his time on campus as part of PMA’s Professional Directions speaker series. The Heermans-McCalmon Writing Competition, which has been around for 70 years, was established at the bequest of Forbes Heermans (class of 1878), in memory of the late George McCalmon, professor of speech and drama. First-place winners earn cash prizes of $250 and second-place winners receive $100. In addition to the cash prize, the first-place winners also receive Final Draft Software, a screenwriting software to write and format screenplays, and student membership to the Dramatist Guild, the professional association of American playwrights. In addition to the presentation of the Heermans-McCalmon awards, the Drama Book Shop award will be presented during the March 23 event. This award is given to a PMA senior with outstanding achievements in theatre and the recipient will receive $100 to the Drama Book Shop. Anna Carmichael is a communications assistant for the College of Arts & Sciences.